Tokay Muscadelle by Campbells of Rutherglen. Intense and mouthfilling palate, malt and toffee combine with rancio characters, a wine of power and complexity with a luscious yet clean finish. Campbell's Topaque is the most wickedly intense, lusciously rich elixer, laden with candied peel flavours, honeycombed fruit and amber complexities. Vinified from parcels of old vine Muscadelle grapes, we can forgive Campbell for cheekily labelling it Liquid Gold, as their forebears were gold miners. A conversation starter when served as aperitiff, the accompaniement of choice to sticky date pudding or Arabica coffee and the finest chocolate. Rutherglen's warm and dependable climate is, in many ways similar to the Rhone region of France and it comes as no surprise that the Rhone specialties of Shiraz (known as Syrah in France) and Durif prosper here. The vital ingredient to Rutherglen's climate is the normally long, warm and dry Autumn ripening period. This enables the grapes to slowly and consistently ripen to maturity, producing the true varietal flavours so evident in the Campbell reds and whites. The grapes are confidently left to linger on the vine and develop the high natural sugar levels and complexity required to produce the unique Muscat and Tokay of Rutherglen. With the range of grape varieties, different vineyard management techniques are employed to maximize each variety's potential. Scott Henry and Geneva Double Curtain are just a few of the trellising systems in use to vary fruit exposure and ripening processes. 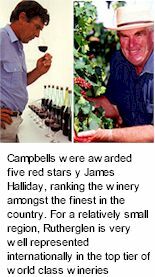 Campbell's of Rutherglen grow Chardonnay, Semillon, Riesling, Trebbiano and Pedro Ximenez. The red varieties include Shiraz, the rare Durif, Cabernet Sauvignon, Ruby Cabernet and Malbec. The world renowned Rutherglen Muscats are made from the variety Muscat Petits Grains Rouge, and the Rutherglen Tokay from Muscadelle. Campbell's nursery block is home to many experimental varieties such as Viognier and Roussane, displaying the winemaking family's commitment to innovation in the vineyard. The Campbell vineyards are in a unique and privileged position. 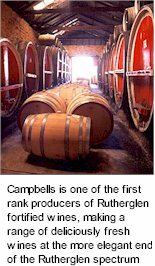 Campbells of Rutherglen are the bearers of over four generations of winemaking knowledge, decades of aged stocks of wine, and some of the most modern winemaking technology available. This allows skillfully management of the ancient Soleras, not only to produce the grand Rutherglen Muscats and Tokays, but to capture the pure natural grape flavours of Rutherglen varieties, and to express them fully in the winery's sensational red and white table wines. A full range of winemaking techniques is used to craft the award winning reds and whites. The use of heat exchangers and refrigerated storage is coupled to gentle tank pressing and controlled fermentation to protect delicate fruit aromas. Rotary fermenters enhance colour extraction for red wines. French and American oak barrels are used sparingly in the fermentation and maturation of some wines, always to enhance, never to dominate the natural fruit flavours. In total contrast, the fortified cellar remains the domain of ancient barrels gently nurturing their precious contents for decade upon decade of ageing to mellow maturity. The ancient Soleras are painstakingly nurtured by the devoted winemaking team. The skilful art of blending, handed down to Colin Campbell by his forebears, is painstakingly carried out to ensure consistency of quality and the perpetuation of the Campbells style - from the most youthful muscats and tokays to the richest and most complex rare classification. The worlds most influential wine critic, American Robert Parker Jnr, regularly heaps praise on Campbells fortifieds, having awarding the Rare Merchant Prince Muscat a near perfect 99 point out of 100, with the Isabella Rare Tokay a whisker behind with 98 points. Parker said of the Merchant Prince, "This is a stunning effort with levels of texture and richness that need to be tasted to be believed!" whilst the Isabella Tokay drew "It possesses superb intensity as well as palate presence with hints of honeysuckle, raisins, black tea, marmalade and toffee". Of the Rutherglen Muscat, "Rich, full bodied and extraordinarily intense, it is an amazing wine!"